The all new Maruti Suzuki swift dzire has been one of the top cars in the modern day to be sold in india and also outside of it. This big Indian giant has also made its way to Philippines for its ultimate debut show. 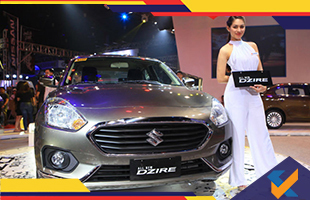 The new 3rd generation dzire has recently made its debut at the Manali International auto show 2018 which is one of the biggest autoshows ever held in the south east Asian continent. Very soon it would be available for sale within india and the new generation model will replace the older ones..
One negative side of the all new swift dzire is that its missing out on a few features that is currently there in the older versions of the dzire. The new variation misses out in LED headlamps, projector headlights, diamond cut alloy wheels and the smartplay entertainment system. As mentioned by the various news sources, the all new swift dzire would be having steel spiked alloy wheels, chrome grille, LED tail lights and chrome coloured tail gate bar. This new model also comes with an exclusive feature of Bluetooth connectivity and audio controls which are mounted on the steering wheel along with 2 DIN audio system which lets the people within the car enjoy the richness in various kinds of music. The new generation Maruti Suzuki swift dzire happens to remain identical to the Indian version that is, the model is kept within the 4 meter mark while the base of the wheel stands at 2450 mm. For the Indian model of this brand new car, the all new Maruti Suzuki swuft dzire happens to run on an engine which is powered by the 1.2 litre k series petrol along with 82 BHP and the amount of peak torque being 113 Nm and also on 1.3 litre DDiS diesel engine which is tuned for 74 BHP and has the capability of reaching 190 Nm peak torque. Both of these engines are available in the 5 speed manual or automatic gearbox, the one preferred by the user who would be driving his or her car. The current model which has been displayed at the manali international auto show case 2018 is offered with a 1.2 litre k series petrol powered engine which is tuned at 86 BHP at 6200 RPM along with a peak torque of 114 Nm at a RPM of 4000. The car comes with a 5 speed manual gearbox and for the automatic ones it is a 4 speed gearbox. For now this variation is available but it has been planed that before the final release of this brand new car, both of the manual and automatic ones would be having 5 speed gearbox system. It is highly expected that the market version of the all new third gen Maruti suziki swift dzire would be carrying within itself, the same motor which was shown at the manali internation auto showcase 2018. This car has already been delivered to most of the markets within india nad its high time for the company to show off their new car in the Philippines.